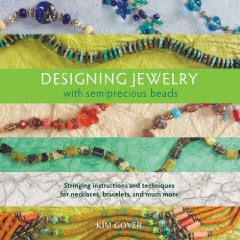 More than 75 different designs, with fool proof instructions and lots of backstory information on the materials, Designing Jewelry with Semiprecious Beads is a book that stone enthusiasts will love! There are so many features that make this a useful book, starting with the bead directory that teaches you about the characteristics and best companions for each stone covered. A project selector will help you to quickly eyeball the design that you wanted to try next. Next you move on to the actual projects, with amazing diagrams and more information. These are each cross-referenced to the techniques used, which are covered in the last section at the end of the book. I love the organization of this book, and I also love the way London-based author Kim Gover has included projects by many talented designers. You won’t feel it’s the same old thing over and over with this book. Check out The Bookshop for lots more links to books about jewelry-making in addition to this helpful guide!